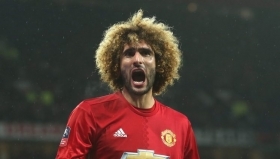 Manchester United are reportedly on the cusp of offloading midfielder Marouane Fellaini after accepting a fee of around £10m from Chinese club Shandong Luneng. The Belgium international has been out-of-favour since Ole Gunnar Solskjaer took temporary charge of the club and he has now decided to pursue a fresh challenge in the Far East. According to Sky Sports News, the Belgian has taken the flight to China ahead of his move which is expected to be confirmed once the medical and personal terms are agreed. Fellaini joined the Red Devils as the first signing of the post-Sir Alex Ferguson era in 2013 and he thereafter developed into a key first-team player irrespective of the criticism from the supporters. He was initially expected to leave the club on a Bosman last summer but he was convinced to sign a new two-year contract under Mourinho, although the move has simply failed to work out for him.